I’m writing this post from home due to the snow day (or impending days). The book I’m sharing is very appropriate for the weather. No Two Alike by Keith Baker is a wonderful book to read to children of many ages. I selected it for a group of children who have moderate-severe needs because it has wonderful pictures and limited words on each page. The book also has a great message. You follow two birds as they journey through the woods and find that everything is different. Every snowflake, tree, and creature are unique, hence the title. The story is very simple but packs a powerful message. I love this book for all students because it teaches us to celebrate our differences. The story leads into many different activities. Any variety of snow crafts would be fun, such as creating scenes from the story or forest scenes. This accompanies winter weather or forest animal vocabulary. When I read this story we made tactile pages on the book. We bought a large copy of the story (which is better for our student’s vision and attention needs) and added on things they could touch like twigs, foam snowflakes, and feathers. Anything with different textures for students to feel will work. We also played a bingo game with the following board I’ve attached. This helps my students learn new vocabulary from the story and practice receptive ID or matching skills. The board below could also be used as a topic board to go along with the story. To use the board below for a bingo game, simply print out two copies of the board. Give one to the students and cut up the other one into the individual pictures. Use those as the game pieces. I like to laminate all of my materials because they undergo some serious wear and tear but bingo games especially. That way you can use a whiteboard marker to cross off the matches and it will wipe right off after you’re done. I’ve also used paint dobbers which are great for students who can’t hold a marker. As I mentioned above, you could also use this board as a topic board to encourage discussion or aid comprehension while reading the story. 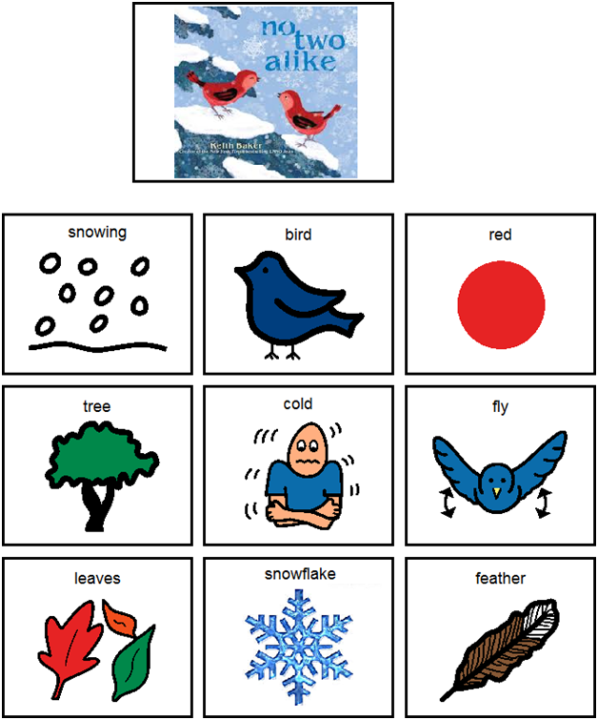 You can use the symbols to help your students form sentences such as, “The bird flies” or “The tree was covered in snow”. However you choose to use the story, have fun with it! Enjoy the snow days if you have them this week (and if not be thankful you weren’t hit with a blizzard). Thanks for reading! To stay updated with our latest therapy tips, app announcements, and blog post sign up for our mailing list here. Don’t forget to follow us on Twitter, Pinterest, and like us on Facebook!